NEW YORK (May 6, 2013) – The 2012 Stanley Cup® champion Los Angeles Kings will play host to the Anaheim Ducks in a regular-season NHL® game outdoors at Dodger Stadium on Saturday, Jan. 25, 2014, at 7 p.m. PT/10 p.m. ET, the National Hockey League announced today. 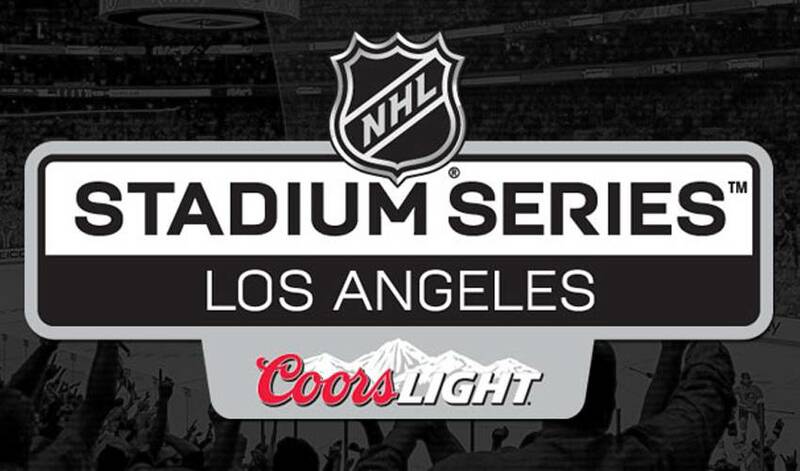 Part of the previously-announced 2014 Coors Light NHL Stadium Series™, a group of games planned for outdoor locations next season, the event will be the first outdoor regular-season NHL game played in the U.S. west of the Mississippi River, the southern-most outdoor NHL game ever and the first-ever in California. Venerable Dodger Stadium will provide the unique setting for the event. Opened on April 10, 1962, it is the third-oldest continually used ballpark in Major League Baseball. Dodger Stadium has hosted more than 147 million fans since it opened. The host for eight World Series and close to 4,000 regular-season games, this will be the first time Dodger Stadium will be the home of a hockey game. With its view of Chavez Ravine overlooking downtown Los Angeles and the San Gabriel Mountains, Dodger Stadium has been called one of the treasured cathedrals of baseball with one of the most picturesque settings in sports. Further details on this special NHL event, including national broadcast information and specifics on ticket opportunities for the season-ticket holders of each team, will be released shortly. Fans interested in receiving more information on ticketing, news and special offers around the event should register at www.NHL.com/2014LosAngeles. Since the advent of a second team in Southern California 20 years ago, the Freeway Face-Off between the Ducks and Kings has been among the most spirited NHL rivalries. While in 2007 the Ducks, the younger of the two franchises, became the first California-based and first West Coast club to win the Stanley Cup championship since NHL teams exclusively began competing for the trophy in 1927, the more senior of the pair matched that feat last season, becoming the first No. 8 seed to be crowned champion. Surprisingly, the Kings franchise has a history with outdoor hockey. The NHL’s first-ever foray outdoors was an exhibition game pitting the Kings against the New York Rangers in the parking lot of Caesars Palace in Las Vegas on Sept. 27, 1991. Played in 85-degree weather, more than 13,000 fans packed the stands to see the Kings defeat the Rangers, 5-2. Thanks in large part to the existence of both franchises, in the last 45 years hockey has transformed from a virtual nonentity to a mainstay in the Southern California sporting scene. In March, the varsity team from Santa Margarita Catholic High School in Rancho Santa Margarita, Calif., won the USA Hockey National High School National Championship. At the 2007 NHL Draft™, Southern California’s Jonathan Blum became the first California-born and -trained first-round NHL draft pick when the Nashville Predators selected him at No. 23. At the 2010 NHL Draft™, held at STAPLES Center, Beau Bennett (Gardena, Calif.) was selected 20th overall by the Pittsburgh Penguins, becoming the highest drafted California-born and -trained player in NHL history. Nine picks later, the Ducks selected Emerson Etem (Long Beach, Calif.) marking the first time two Californians had been selected in the first round. NHL Network™ and NHL.com will provide extensive coverage live from Southern California leading up to and after the game. NHL Social™ will have exclusive coverage on all social platforms, including the use of the hashtag #StadiumSeries. Since the NHL established the tradition of hosting regular-season games outdoors to celebrate the origin and traditions of hockey, fans across North America have expressed their desire for those celebrations to spread across the hockey landscape. Five of the six most watched regular-season NHL games in the U.S. in the past 38 years have been played outdoors. The NHL recently announced that the 2014 Bridgestone NHL Winter Classic® is scheduled for Wednesday, Jan. 1, when the Detroit Red Wings will host to the Toronto Maple Leafs at Michigan Stadium on the University of Michigan campus. It is anticipated that the 2014 Bridgestone NHL Winter Classic® could set a world record for attendance at a hockey game. Also, the NHL has announced that the Chicago Blackhawks and the Pittsburgh Penguins will participate in the 2014 Coors Light NHL Stadium Series™ on March 1, when they face off at Soldier Field. More information on that event can be found at www.NHL.com/2014Chicago. The first-ever NHL regular-season game contested outdoors was played in 2003 when the Edmonton Oilers hosted the Montreal Canadiens at Commonwealth Stadium. Since then, the NHL has played six additional regular-season games outdoors. For a history of these games, please visit NHL.com. Official fan packages for all NHL signature events will be available from Global Event Forum, the Official NHL Events™ Fan Package Partner. For more information please visit nhl.com/fanpackages.